GENUINE 557.80 CT OVAL FACETED RUBY GEMSTONE! 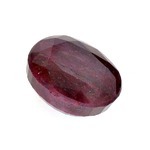 Very Large Ruby (Corundum) Oval Faceted 557.80 CTS, Purplish-Red in Color, Quality 2 - Commercial - Fair loose Gemstone!! It comes with an appraisal by Gemological Laboratory of America.